Grandparents Day Gift Basket Giveaway!! If you are like me, you love receiving and giving gift baskets as a gift. Being a grandparent, we love the gifts our children and grand children send us. Gift baskets are so special and really say that you care about the person you are giving them too. We loved the New England Breakfast Basket that we received as a gift! 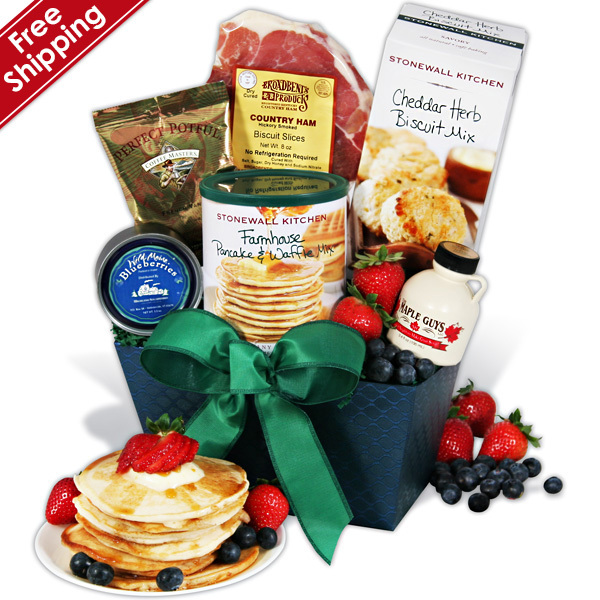 This basket includes: Stonewall Kitchen Pancake/waffle mix, Stonewall Kitchen Biscuit mix, blueberries, syrup, bacon and coffee! Stonewall Kitchen originates in Maine and makes delicious jams, jellies and baking products and more! Grandparents are playing bigger roles in the family than ever and they should all get a gift for their big day! Our grand kids call me, Grand Nettie and my hubs, Pop’s. They are just the cutest kids ever!! Answer this question: If you are a grandparent, what name do your grand children call you? Or, what name do you call your grandparents? 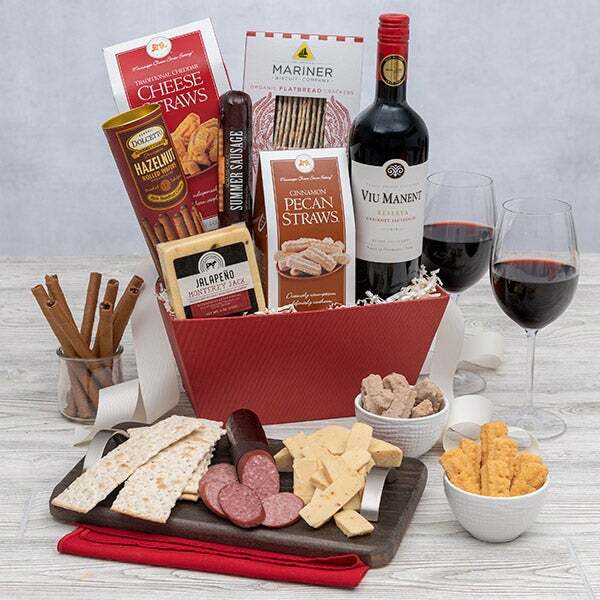 This post is sponsored by#gourmetgiftbaskets, all opinions are my own as always. In our family it’s “grandma” and “grampa”. The grandkids call me Grams and my hubby Gramps. Congratulations to you on your “blogaverssary”! I love your recipes, tips and stories. Thank you for enlightening us. My grandsons call me Nana and I love it, thanks! Grammy is the name I go by! In my family, grandparents are typically referred to as mommom and poppop. I call one grandmother “Grandma” and the other “Yia Yia” because she’s greek. My kids call my mom Grandmother and I called mine Granny! My most wonderful name is granny!! Grandma or Nana Donna and Grandpa or Papa Steve! We are MiMi and Pops to our grandson. It’s Grandma & Pa for our family! My grandkids call me grandma, and my great grandkids call me GG. (Greatgrandma) Thank you for the entry.. I think my grandkids will call me NANA !!! We’re grandma & grandpa. That’s also what I called my grandparents. I call mine Grandma and Grandpa. My grandparents are Grandma and Grandpa. My kids have Mammaw, Pappaw, Nana, and Pops. Everyone gets their own name! Not a grandparent yet but I called my mother’s mother Granny. She was a fashionista so it was funny. We are Grandma and Papa. Thank you for the wonderful giveaway. I’m known to my grandkids as “Grammy”! It’s my favorite of all the names I’ve ever been called! In our family it’s mamaw and pop pop. My Grandparents are Mema and Papa. If you are a grandparent, what name do your grand kids call you? Or, what name do you call your grandparents? My Grandparents were grandma and grandpa. I dont have grand children. I only have Grand Dogs and they call me Rulf. I called my Grandparents, Grandmother and Grandpa. My granddaughter isn’t talking yet, I call my grandmother Nana. We are trying to get everyone together for a 5 generation picture soon. I’m not a grandparent yet (unless dogs count). I called my grandmother Dana. My daughter called my mother Grandmere. I call my grandmother nana.